In this article, we’ll cover some usage examples of how you can utilize Estimation & Payment Forms within your X or Pro powered site. We’ll mainly be focusing on how to use Estimation & Payment Forms and so may skip over some finer details. Note: This article covers only a small portion of what you can achieve with Estimation & Payment Forms, make sure you take a look at the official documentation which is linked to in the Documentation section below to explore the full possibilities of this powerful tool. Here you'll see your current forms be able to add a new form, import forms, and export all forms. As you can see on the above there is the Steps Manager and then the Form settings. We'll explore the form settings first then take a look at the steps manager. The first tab in Form settings is General. This tab contains basic settings for your form such as the title, progress bar, currency symbol, initial price etc. Each option has a description of its functionality on hover. 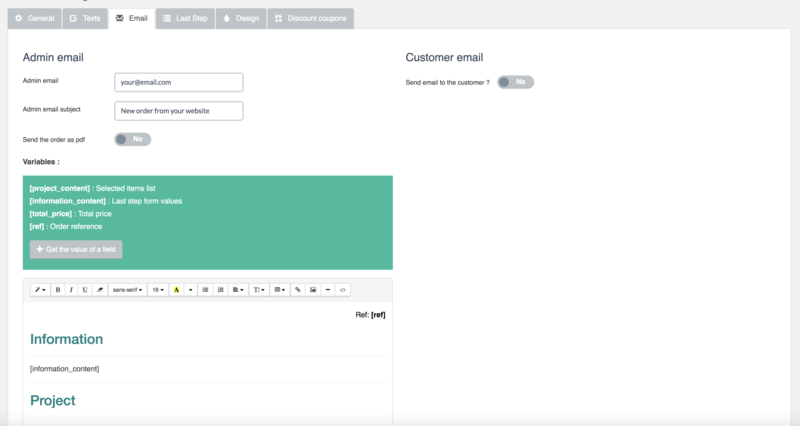 This tab contains options for changing all text that outputs on the front-end of your form. This tab contains options for all the email settings for the form. It's worth noting these are not global settings but rather email settings for the specific form you're setting up. In addition to being able to modify the form details sent to the admin, you can also configure an email to be sent to the user who filled in the form. Another great aspect of the email integration is you can send the contacts directly to either Mailchimp, MailPoet or GetResponse. This tab contains options for the last step of your form, including calling custom URLs on close. Showing summaries, displaying a legal notice/terms and conditions and selecting payment methods. 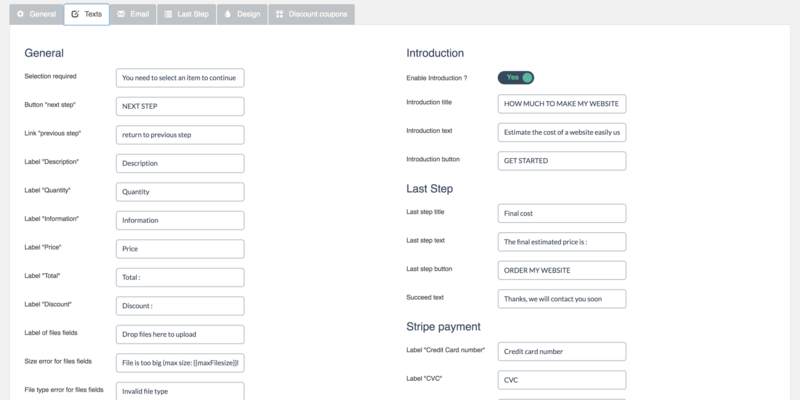 One of the great features about Estimation and Payment forms is that you can use PayPal and Stripe, set any form creation as a subscription, and also it integrates directly with WooCommerce to connect any form to a WooCommerce product to add to cart. This tab contains all design options for your form including setting custom fonts and custom CSS rules along with setting custom colors which are used throughout your form. This tab contains options for setting discount codes on or off, if discount codes are set to On you'll then see the discount code form like above where you can add your custom discount codes and set the percentage value off. Scroll back up the page to the Steps Manager. Here is where you'll actually build your form and connect each step as required. To get started click on Add Step. Clicking the Flag Icon sets that step as the first step in your form. When you first add a step, the step will be automatically selected as the first step in your form. If you click on the Pencil Icon you'll be taken the Step Options screen where you can edit the step you just created. Once you're happy with that specific list item, click Save. You'll then be able to add another list option to that step if you'd like. Or create a new step. To get back to the steps manager, click the X in the corner of the Step Options screen. Add a second step and you'll then be able to create a link to the first step. 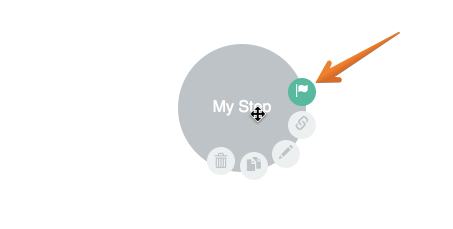 To create a link hover over the new step you've just created and click on the Link icon. You can then link that second step to the first step when you click the link icon and then click on the first step which will link it to the second. 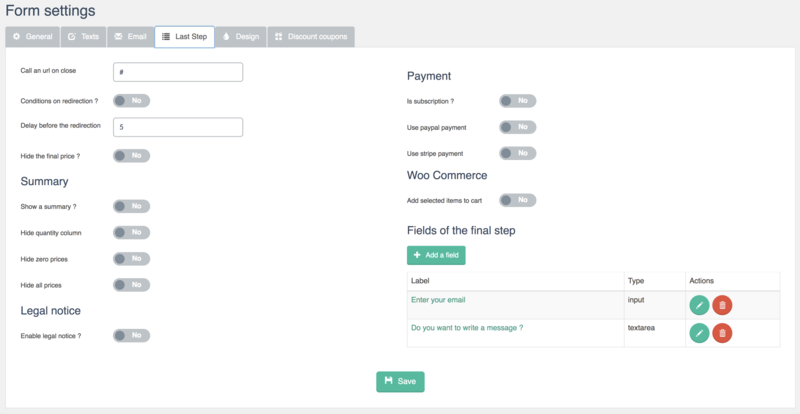 Congrats you've now successfully set up your first form in the Estimation & Payments form plugin. As we mentioned further up, we're only going to cover how to use Estimation & Payments form and not every option it provides, to learn more about Estimation & Payments Form check out the official documentation here. Release Cycles – While we try to include the latest version of Estimation & Payment Forms with each release, occasionally the release cycle of the plugin will prevent this from being possible. Essentially, since we have no idea when Estimation & Payment Forms will be releasing new versions of the plugin, we cannot plan our releases around this. Because of this, if we have already begun the process of finalizing our release and submitting it to ThemeForest for review while Estimation & Payment Forms is putting out a new version of the plugin, that version of the plugin will not be able to make it into the theme until the next release at the earliest. Not Always Necessary – Some of Estimation & Payment Forms releases have only included simple "bug fixes" without any huge additions or modifications to the rest of the plugin. Because of situations like this, it is up to our discretion whether or not a new release will make it into the theme or not based on the nature of the update. Because of these reasons (among others), there is no need to register your license for Estimation & Payment Forms if you happen to have one. In fact, doing so is discouraged in order to prevent any potential conflicts when updating, as previously mentioned. If you happen to see a notification in your WordPress admin panel asking you to register Estimation & Payment Forms upon activation, simply dismiss this notice. 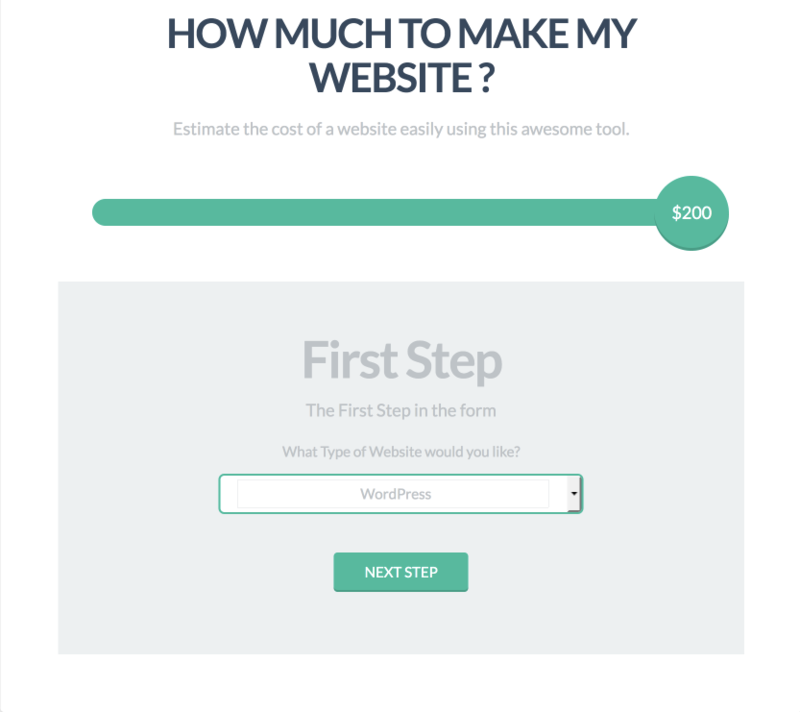 Estimation & Payment Forms is an extremely powerful and flexible plugin that will assist you in creating the perfect website. 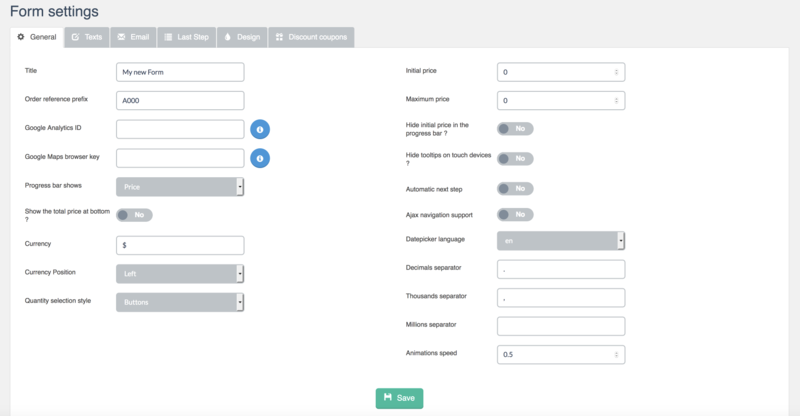 The version of Estimation & Payment Forms included with the theme is an unmodified version of the plugin. We do our best to ensure that the version of Estimation & Payment Forms included with X is as up-to-date as possible; however, this might not always be the case based on the reasons listed in the "Bundled Version" section above, which includes stability, release cycles, and the fact that not all updates are necessary. Any questions concerning the usage of an Estimation & Payment Forms feature should be directed to the online documentation referenced in the "Documentation" section above.